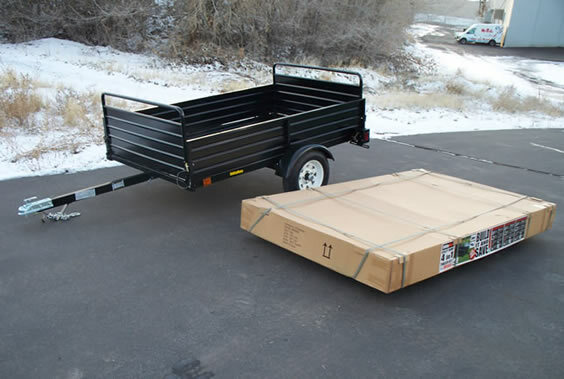 The 4 in 1® Dump trailer (shown above) has an exclusive load bearing front and back corrugated steel drop gate(s), which instantly increases the bed length from nearly 8ft. to almost 12 ft when both gates are lowered. Every 4 in 1® dump trailer comes with a payload balancing system which provide exceptional balance and ease of mobility. The reinforced corrugated steel side panels are very easy to remove to accommodate wider pay loads. This Trailer is truly the "Best of Class" when it comes to the competition. As a trailer, there is no other trailer that will give you as much functionality or quality for the price. (2) Position, tongue extends additional 24"